(Excerpt from Goodreads) In 1536 it seems the entire known world is changing–strange new lands are discovered and the Reformation is challenging Rome and its power. In England the king’s declaration of a new church and dissolution of the monasteries overturns the customs and authorities of centuries. In the new world order, spies abound and no one can be trusted. To Brother Pacificus of the Abbey of St. Benet’s in Norfolk, it looks like his abbey alone will be spared dissolution. But this last Benedictine house is mired in murder and intrigue. Then when Pacificus falls under suspicion, more than his own dark past comes to light, while the body count keeps rising. Pacificus’s fate becomes entwined with that of three local children after their parents are arrested for treason and heresy. Protected only by this errant monk, a mysterious leper, and a Dutch eel-catcher, the children must quickly adjust; seeking their own identity, they soon find that neither parents nor protectors are quite what they seem. Based on historical events, this post-medieval mystery is laced with romance, fueled by greed, and punctuated with bouts of feasting, smuggling, and jailbreak. This story is about a pivotal time. Henry VIII has been declared the head of the church, those that don’t follow the correct religion are tortured and killed. And there are those like Brother Pacificus who has a past and questions his following the “true” church. Brother Pacificus becomes the guardian of three children when their parents are murdered for being heretics. It is up to Pacificus to try and get them to some family that will protect them. But Pacificus is just one part of the story. There are so many characters that face death, life, religion, and what it really means to believe in something. There is a lot that is happening in this story. The story has many layers that you might not think much of at first, but they over lap and shape this book into much more than a simple story about one monk protecting three kids and questioning his own beliefs. The books becomes many stories interwoven together. The research and historical facts make this book more realistic and make it more than a book you can casually read. This is a great story and anyone that likes history will love this book. It does take a little bit to get into but once I got into the story I couldn’t wait to see what happened next. Make sure to check out The Heretic. 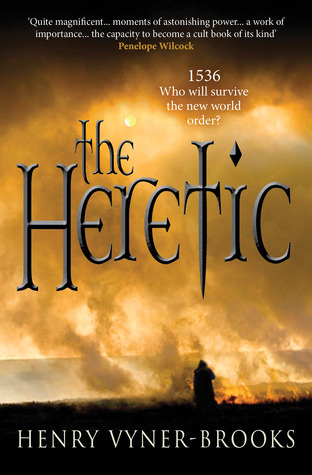 To purchase The Heretic make sure to visit Amazon, Barnes and Noble, and Goodreads. I received this book for free from the author in exchange for an honest review.